It is officially the holiday season, and that means baking! 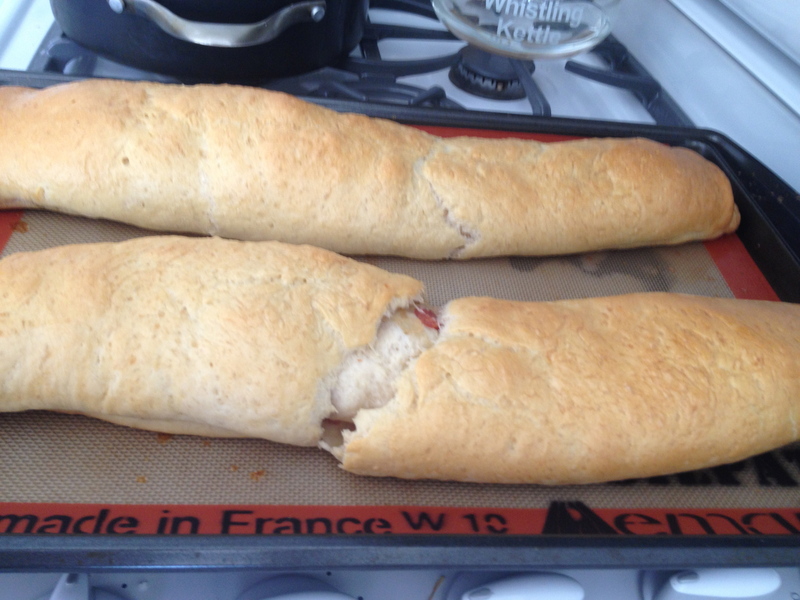 But … I have to confess, I lost the bacon bread recipe. For those who don’t know the story, Grandmom J. had the best bacon bread. The slightly sweet bread with the savory, slightly salty filling of bacon and onions. It was one of the food highlights I vividly remember from growing up. (Now if I could figure out dad’s mom’s chiffon cake icing I would be set … but that is a whole other day.) I don’t think anyone ever had written recipe so I tried, and erred, over a few years until I found a combination that worked; it almost tasted just like grandmom’s. But … as I am doing more and more frequently, I misplaced the recipe. Can’t find it. I wanted bacon bread so badly today (really says the holidays to me) and I just could not find it. So … I took a stick of unsalted butter and melted it in a small pan with 1/3 cup milk. I used regular fat free milk, but I think the soy milk I usually use, or full fat milk would work better. Once that melted I added 1/4 cup of water to cool it slightly. In a bowl, I combined 1 tablespoon yeast, 1/2 cup flour and slightly less than 1/4 cup sugar. Mix then add the butter mixture and stir. Wait a few minutes to ensure the yeast isn’t dead (I look for bubbles and foam) then add eggs. This was the tricky part. I had two actual eggs (I know, I could have gone to the grocery store, but I could have searched the house for my recipe again too) and egg whites for Bob’s omelette lunches. So … in goes both eggs and the equivalent of one more egg. Mix well and pray a little, then add four, 1/2 cup at a time until the dough no longer sticks to your hands. (About 3 cups, but one of the few things I remember from a bread class is that the amount of flour you use in baking can vary wildly depending on humidity, so don’t be afraid to add more or less than a recipe says.) Knead and let rest, covered in a warm spot. 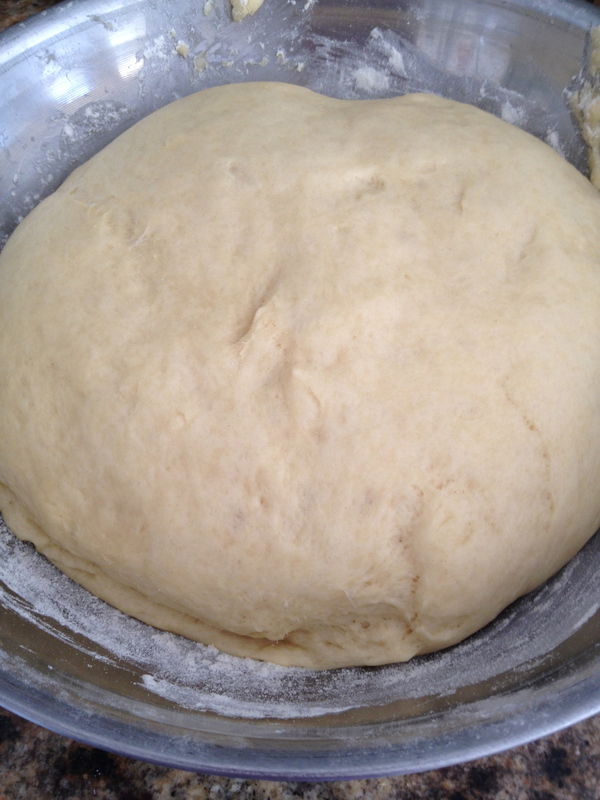 The dough should rise for about an hour, then punch down and knead for another few minutes. Put back in the bowl, cover and let rest again. (I never said this was quick, just good.) 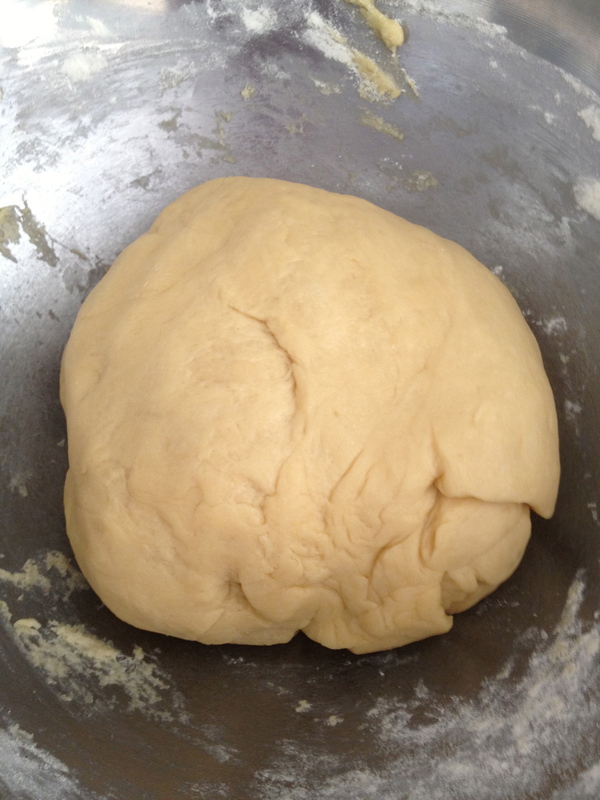 After about 30 minutes, punch the dough down again and the roll out to about 1/8 inch thickness. I divide the dough in half just because it is easier to work with. 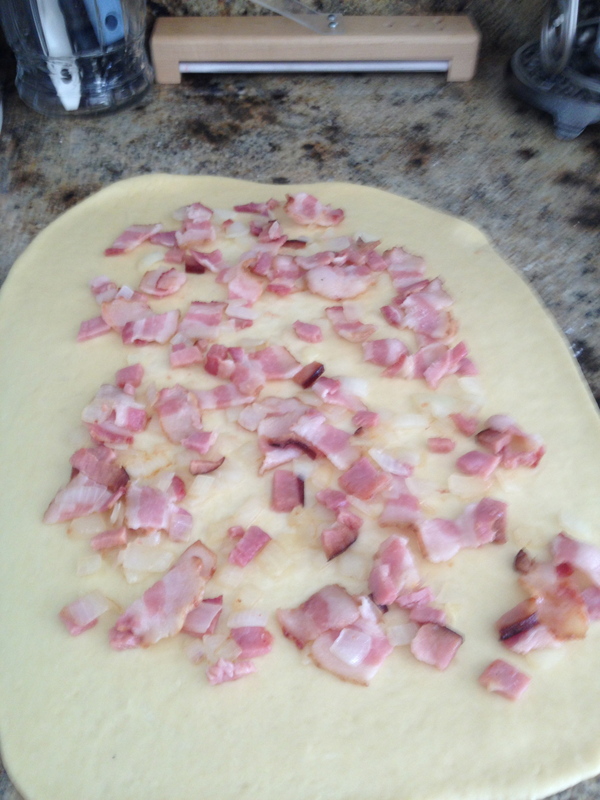 While the dough is resting the second time, chop one small to medium onion and between 1/2 and 3/4 pound of bacon. I used about 1/2 a package of bacon plus some leftover ham for today’s trial. Cook the bacon down until some of the fat is rendered then add the onion and cook, stirring frequently. You want the bacon cooked, but not crisp for this. 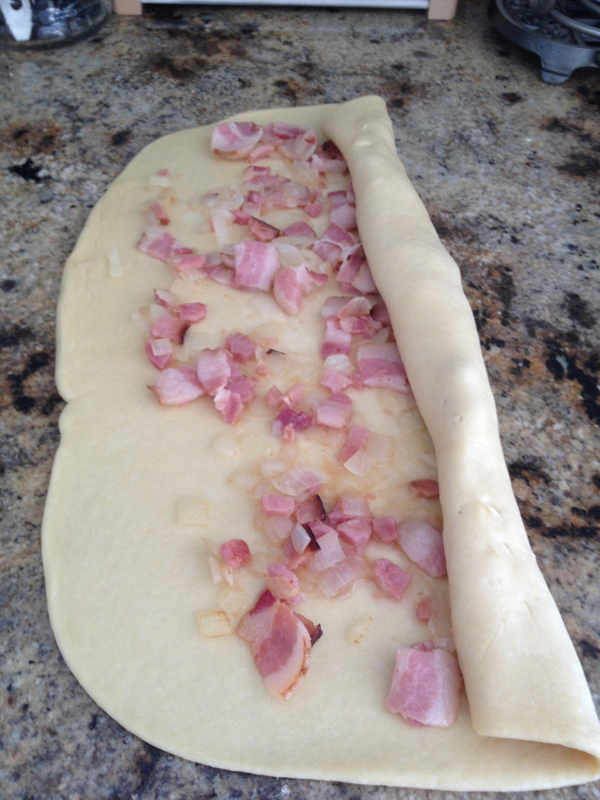 Then, spread the mix over the rolled dough, but not totally to the edge – you want to leave room to roll. Once the dough is rolled, transfer to a baking sheet, cover and let rise again as you heat the oven to 325. For a glossy crust, use an egg wash and bake for about 30 minutes. It may be a little longer or a little shorter, but you are looking for a golden crust. The results … not bad. The overall bread was good, and it had most of the flavor I was looking for. But … I think three actual eggs, soy or whole milk, and maybe a touch more sugar would be right. 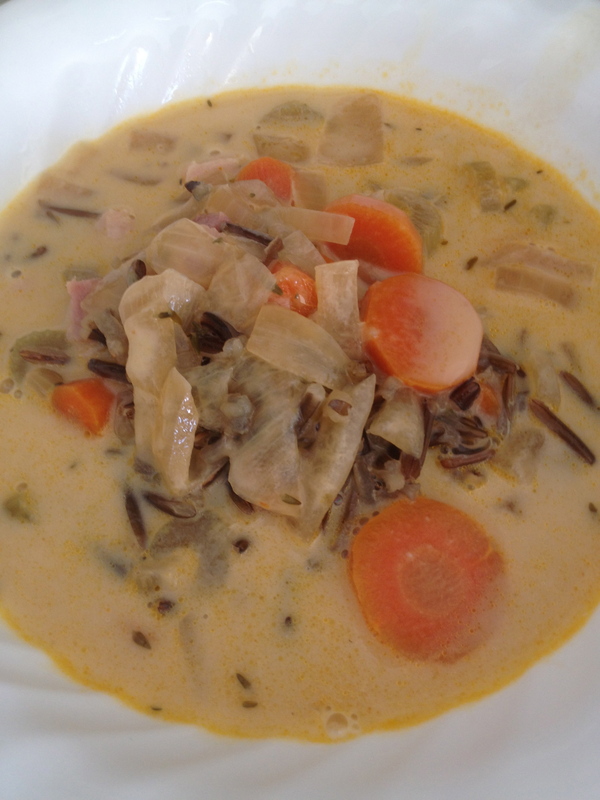 But it did make for a great addition to lunch … the Wild Rice Soup!